A couple Wabash faithful managed a Wabash Day project on October 10, during a very busy weekend in Fulton County. Doug Morton ’68 and Andy Perkins ’97 helped the City Park by painting a portion of the area playground, dubbed the “Manitou Mountain,” a popular activity spot for area children. 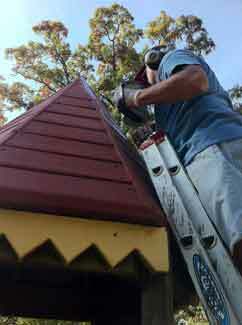 Pictured: Doug Morton ’68 climbs an extension ladder to paint part of area playground equipment.